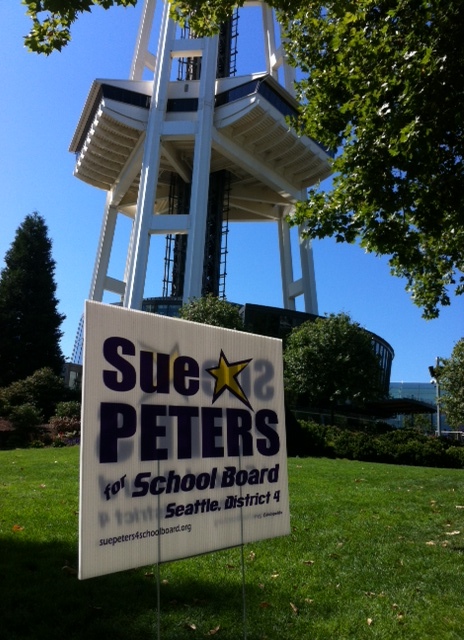 As my campaign predicted, the political action committee (PAC) created to get political lobbyist and consultant Suzanne Dale Estey elected to the Seattle School Board, has stooped to yet another low, and attacked my candidacy yet again. Their latest dishonest mailer arrived in mailboxes citywide Wednesday. This is the third time the PAC for Dale Estey has launched a smear attack in this campaign, unprecedented for a Seattle School Board race. (See: My Opponent’s Side Goes Negative: My Response.) It’s also very disappointing. Demonstrating the negative influence of excessive money in political campaigns (a hot topic in Seattle right now, where we have two initiatives addressing campaign funding on the current ballot), the “Great Seattle Schools” PAC has amassed over $100,000 from a small group of wealthy individuals (with no children in Seattle Public Schools) who are apparently desperate to buy the election for my opponent and will resort to any means they think necessary. What’s more, their latest claim is absurd. They refer to a factual flow chart created three years ago by Seattle Education Blog co-founder Dora Taylor and myself, in which we illustrate the flow of money from two of the largest private funding sources in public education: The Gates Foundation and the Broad Foundation. It is neither. In fact, the primary source of the information for this chart was the Gates Foundation itself. Its informative online database of awarded grants lists where it has invested its money. It’s no secret that education is one of the foundation’s key areas of focus. Called “The Lines of Influence,” when we posted our diagram three years ago, we received an overwhelming positive response nationwide, for it connected various dots. It documented the role and influence of private foundation money in public education. 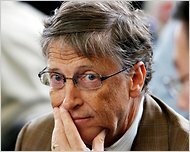 Bill Gates’s foundation spent $373 million on education efforts in 2009, the latest year for which its tax filings are available. (…) For years, Bill Gates focused his education philanthropy on overhauling large schools and opening small ones. His new strategy is more ambitious: overhauling the nation’s education policies. To that end, the foundation is financing educators to pose alternatives to union orthodoxies on issues like the seniority system and the use of student test scores to evaluate teachers. In some cases, Mr. Gates is creating entirely new advocacy groups. The foundation is also paying Harvard-trained data specialists to work inside school districts, not only to crunch numbers but also to change practices. It is bankrolling many of the Washington analysts who interpret education issues for journalists and giving grants to some media organizations. The foundation spent $373 million on education in 2009, the latest year for which its tax returns are available, and devoted $78 million to advocacy — quadruple the amount spent on advocacy in 2005. Over the next five or six years, Mr. Golston said, the foundation expects to pour $3.5 billion more into education, up to 15 percent of it on advocacy. Given the scale and scope of the largess, some worry that the foundation’s assertive philanthropy is squelching independent thought, while others express concerns about transparency. Few policy makers, reporters or members of the public who encounter advocates like Teach Plus or pundits like Frederick M. Hess of the American Enterprise Institute realize they are underwritten by the foundation. And apparently Bloomberg BusinessWeek is a “conspiracy theorist” as well. See: Bill Gates’ School Crusade, July 15, 2010. Diane Ravitch also joins this group of ‘theorists’ with her best-selling books about corporate ed reform, The Death and Life of the Great American School System: How Testing and Choice Are Undermining Education (Basic Books, 2011) and Reign of Error: The Hoax of the Privatization Movement and the Danger to America’s Public Schools (Knopf, 2013). So I am in good company. This ‘conspiracy theory’ theory was first circulated last week in emails by two supporters of my opponent, Jabe Blumenthal, who was fe atured in the Seattle Times last year for threatening to vote against his own political party’s gubernatorial candidate over education policy (Dems draw fire from top donors in rift over education reform — Several well-heeled Democratic Party donors have split with the state party and legislative leaders over education reform), and Lisa McFarlane (pictured), formerly of the League of Education Voters, who now works as a political and charter school lobbyist for the controversial national political enterprise, Democrats for Education Reform (DFER). Already I have gotten responses from people around the city who received this mailer, ranging from utter disgust with the Estey campaign (always the risk with negative campaigning), to compliments for the informative flow chart. Clearly Dale Estey and her backers are worried that they cannot win this race on her own merits. In fact, there is increasing evidence that my opponent’s alleged merits are not all that they seem, as her credibility has come into question on various counts. Disappointingly, Dale Estey’s supporters are apparently not interested in discussing the real issues facing our schools, families and students, like serious overcrowding, class sizes, policies that are out of touch with the realities of our communities, curriculum, excessive testing, and equal resources and opportunities for our district’s 51,000 students, just to name a few. I urge voters to sort through the facts themselves and not be swayed by the distortions of a small group of wealthy special interests (and a candidate who fails to denounce them) who are desperately trying to buy this election, by any means necessary. 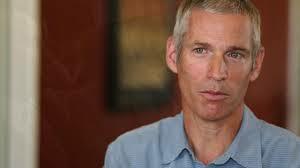 I believe the Estey PAC has underestimated the intelligence and integrity of the Seattle electorate. As a trained journalist and public education advocate, I remain committed to facts and the truth, as I have demonstrated in the past, and will continue to demonstrate this commitment if I am elected to serve on the school board. Thank you for your support. Please remember to vote. Clearly the stakes are very high in this election. DONATE! VOLUNTEER! VOTE! PASS IT ON!